While tipping points in marine ecosystems are often thought of as negative events, tipping points can also be harnessed in restoration efforts to help speed up the path to recovery. The Ocean Tipping Points team has been working to better understand how tipping point concepts and science can help restoration and recovery efforts by understanding the thresholds that exist in ecosystems and offering scientific and policy advice for improving the outcomes of restorations efforts by implementing a tipping points perspective. 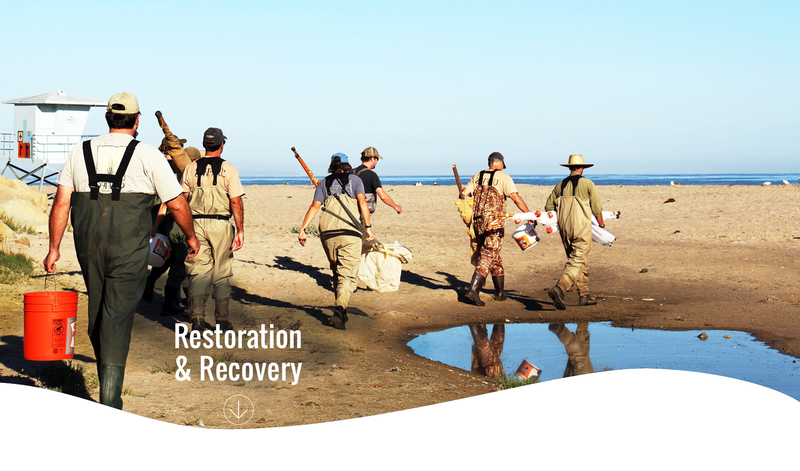 Here you’ll find resources and guidance to help you increase the use of tipping points science in your own decision-making to help improve your restoration and recovery management. Why should we care about tipping points in management of restoration or recovery? Recovery and restoration of marine systems can be a daunting task. As human impacts on ecosystems become more numerous and intense1,2, there is potential for an increased likelihood of tipping point responses across ecosystems3. This can lead to an increase in undesirable ecosystem shifts, slower ecosystem recovery4 and significant changes in ecosystem services and function5. Feedback mechanisms can make recovery from an ecosystem shift much harder and more costly than preventing such a shift before it occurs. A big management investment may initially be needed to get the system up and over the identified threshold and moving toward its recovered state6,7,8. But, advances in tipping points science have begun to help managers more easily identify thresholds of concern and set quantitative targets to more effectively recover marine ecosystems and species. For example, at Eglin Air Force Base in Florida, USA, managers have undertaken a massive restoration effort in recent years to facilitate the recovery of longleaf pine (Pinus palustris). After a multi-million dollar weapons testing contract was rejected due to Eglin's inability to describe potential impacts to the federally endangered red-cockaded woodpecker (Picoides borealis), which relies on longleaf pines for critical habitat, resource managers at Eglin developed a management plan to restore their local population of longleaf pines. One of the main components of the plan, which was informed by scientific experiments and modeling, was a burn regime timed to better match the longleaf pine life cycle and targeted in areas that were suitable habitat for longleaf pines9. By reintroducing fire to Eglin, managers reintroduced a driver in order to foster conditions that were present prior to the ecosystem shift. Managers and scientists also monitored recovery and used adaptive management to fine-tune fire regimes over time. Eglin Air Force Base now has the largest stand of longleaf pines in the U.S. and is a site of critical conservation importance9. Incorporating understanding of potential threshold responses at the individual, population, and community level in restoration plans can greatly increase the chances of successful recovery10. In light of our increased understanding of the prevalence of non-linear responses in marine ecosystems, we as a science and management community can benefit from new or renewed consideration of how restoration policies, plans and strategies can account for potential tipping points. The purpose is to incorporate knowledge of how and when tipping points were crossed in the past in order to increase the chances of successful recovery in the future. Please refer to our National Environmental Policy Act (NEPA) Crosswalk which explores the development and implementation of environmental and cumulative impact analyses under NEPA identifying ocean tipping point science “integration points” along the way. Click on the links below to learn more about how the concepts of ocean tipping point science can provide value to the protection of ecosystems, ideally without adding significant work or capacity need. Find more information on integrating tipping points concepts into fisheries management and recovery under the Magnuson-Stevens Act. If you are looking to dive deeper into analysis tools that may be useful to help improve your own restoration and recovery efforts, see our table of scientific analysis tools. For more information on how to apply tipping points science to your own general adaptive management decision-making visit our Ocean Tipping Points Guide. The South Florida Management District used a tipping points approach to identify what caused the Florida Bay ecosystem to undergo a dramatic loss of critical seagrass habitat and develop a recovery plan to avoid threshold responses in the system. Upstream land use changes in the 1970s caused salinity in Florida Bay to increase, eventually leading to a mass seagrass die-off in the late 1980s11,12,13. Loss of seagrass altered a suite of ecosystem conditions, including lower dissolved oxygen, higher nutrient concentrations, and reduced abundance of key grazers11. The system ultimately crossed a threshold into a new state where phytoplankton blooms began to plague the bay and commercially important fish populations plummeted11,13. Regional management authorities ultimately determined that increased salinity was the primary driver of seagrass die-off. The South Florida Management District subsequently implemented the Minimum Flows and Levels program to monitor freshwater inputs to the bay. When freshwater flows drop below a specific management target, upstream agricultural and municipal users are prohibited from diverting water. Managers also track ecological indicators of seagrass health, including distribution, cover, and species composition on a weekly basis. These data are used to determine efficacy of target-based control rules around water delivery and are critical for evaluating and adjusting management to avoid future tipping points13,14. By implementing a tipping points perspective including successful identification of the primary driver of change, ecosystem monitoring, and adaptive management actions, the South Florida Management District was able to restore the health and stability of the seagrass community in the bay. In Elkhorn Slough, California, USA, successful recovery of an eelgrass system was accomplished through the identification and management of population tipping points and trophic cascades. Here, analysis of long-term time-series data from showed a shift from an eelgrass-dominated to a crab-dominated ecosystem, as nutrient concentrations increased and sea otter numbers declined. Using these data, along with spatial data and experimental research, researchers revealed that the presence and abundance of key functional groups can be critical to the recovery of an eelgrass system that has been exposed to nutrient pollution. Contrary to expectations, nutrient reductions alone did not result in eelgrass recovery in the slough. After being hunted to near extinction, the reintroduction of sea otters to Central California began to effect change in the slough through a trophic cascade. Otters preyed on crabs, releasing many grazers from predation pressure. The growing population of grazers, in turn, reduced the amount of algae growing on the eelgrass, allowing it to flourish. In this example, both a reduction in nutrients and the reintroduction of a top predator were required to mitigate the effects of nutrient pollution and recover the system15. Folke, C., S. Carpenter, B. Walker, M. Scheffer, T. Elmqvist, L. Gunderson, and C. S. Holling. 2004. Regime shifts, resilience, and biodiversity in ecosystem management. Annual Review of Ecology Evolution and Systematics 35:557–581. van der Heide, T., E. H. van Nes, G. W. Geerling, A. J. P. Smolders, T. J. Bouma, and M. M. van Katwijk. 2007. Positive feedbacks in seagrass ecosystems: Implications for success in conservation and restoration. Ecosystems 10:1311–1322. Martin, K. L., and L. K. Kirkman. 2009. Management of ecological thresholds to re-establish disturbance-maintained herbaceous wetlands of the south-eastern USA. Journal of Applied Ecology 46:906–914. Dixson, D. L., D. Abrego, and M. E. Hay. 2014. Chemically mediated behavior of recruiting corals and fishes: a tipping point that may limit reef recovery. Science 345:892–897. Gunderson, L. H. 2001. South Florida: the reality of change and the prospects for sustainability: managing surprising ecosystems in Southern Florida. Ecological Economics 37, 371–378. Rudnick, D.T., Ortner, P.B., Browder, J.A., S.M Davis. 2005. Florida Bay conceptual ecological model. Wetlands 25 (4), 870–883.